For the North American region to which the Canadian Prairies belong, see Great Plains. The Canadian Prairies is a region in western Canada, which may correspond to several different definitions, natural or political. Notably, the Prairie provinces or simply the Prairies comprise the provinces of Alberta, Saskatchewan, and Manitoba, as they are partially covered by prairie (grasslands). In a more restricted sense, the term may also refer only to the areas of those provinces covered by prairie; their portions of the physiographic region known as the Interior Plains. Prairie also covers portions of northeastern British Columbia, though that province is typically not included in the region in a political sense. The prairies in Canada refers to temperate grasslands and shrublands biome, within the prairie ecoregion of Canada and consists of Northern mixed grasslands in Alberta, Saskatchewan, and southern Manitoba. 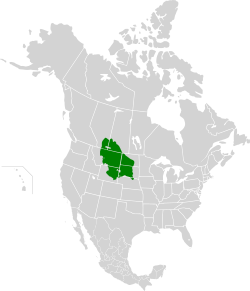 Northern short grasslands in southeastern Alberta and southwestern Saskatchewan. Northern tall grasslands in southern Manitoba, and Aspen parkland, which covers central Alberta, central Saskatchewan, and southern Manitoba. The Prairie starts from north of Edmonton, it covers the three provinces east to the Manitoba-Minnesota border. 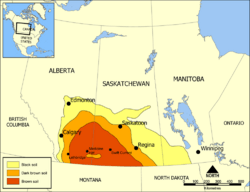 According to the Köppen climate classification the Canadian prairies generally experience dry semi-arid climates (Köppen Bsk) in the brown soil regions, and somewhat dry Humid Continental climates (Köppen Dfb) in the outer dark brown and black soil areas. The Canadian prairies typically experience about 12 to 15 in (300 to 380 mm) of annual precipitation in the semi-arid areas while they experience 16 to 20 in (410 to 510 mm) in the continental regions. Manitoba is generally the coldest and most humid of the three prairie provinces. The area is also prone to thunderstorms in the spring and summer. Some of these storms, especially further south, are strong enough for tornadoes. Although the Prairie Provinces region is named for the prairies located within Alberta, Saskatchewan and Manitoba, the physical geography of the three provinces is quite diverse, consisting of portions of the Canadian Shield, the Western Cordillera and the Canadian Interior Plains. The plains comprise both prairies and forests while, with the exception of Arctic tundra along the Hudson Bay, the shield is predominantly forested. Three main grassland types occur in the Canadian prairies: tallgrass prairie, mixed grass prairie, and fescue prairie (or using the WWF terminology, northern tall grasslands, northern mixed grasslands, and northern short grasslands). Each has a unique geographic distribution and characteristic mix of plant species. All but a fraction of one percent of the tallgrass prairie has been converted to cropland. What remains occurs on the 6,000 km2 (2,300 sq mi) plain centred in the Red River Valley in Manitoba. Mixed prairie is more common and is part of the dry interior plains that extend from Canada south to the U.S. state of Texas. More than half of the remaining native grassland in the Canadian prairies is mixed. Though widespread in southern Saskatchewan and southeastern Alberta, because of extensive cattle grazing, it is estimated that only 24% of the original mixed prairie grassland remains. 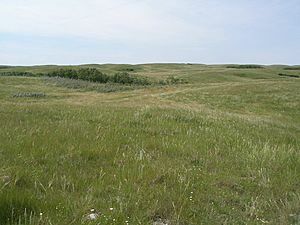 Fescue prairie occurs in the moister regions, occupying the northern extent of the prairies in central and southwestern Alberta and west-central Saskatchewan. Location of communities in Alberta, Saskatchewan and Manitoba which comprise Canada's Prairie Provinces. Some of the prairie region of Canada has seen rapid growth from a boom in oil production since the mid-20th century. The Prairies are distinguished from the rest of Canada by cultural and political traits. The oldest influence on Prairie culture are the First Nations, who have lived in the area for millennia. The first Europeans to see the Prairies were fur traders and explorers from eastern Canada (mainly present-day Quebec) and Great Britain via Hudson Bay. They gave rise to the Métis, working class "children of the fur trade." Not until the Canadian Pacific Railway was built did widespread agricultural settlement occur. During their settlement, the prairies were settled in distinct ethnic block settlements giving certain areas distinctively Ukrainian, German, French, or Scandinavian Canadian cultures. Some areas also developed cultures around their main economic activity. For example, southern Alberta is renowned for its cowboy culture, which developed when real open range ranching was practiced in the 1880s. Canada's first rodeo, the Raymond Stampede, was established in 1902. These influences are also evident in the music of Canada's Prairie Provinces. This can be attributed partially to the massive influx of American settlers who began to migrate to Alberta (and to a lesser extent, Saskatchewan) in the late 1880s because of the lack of available land in the United States. The Prairies continue to have a wide range of political representation. While the Conservative Party of Canada has widespread support throughout the region, the New Democratic Party holds seats at the provincial level in all three provinces, forming the government in one, as well as holding seats at the federal level in all three provinces. The Liberal Party of Canada presently holds federal seats in urban areas of Alberta, Saskatchewan and Manitoba, while the Alberta Liberal Party holds a provincial seat in Alberta and the Manitoba Liberal Party holds a seat in Manitoba. Canadian Prairies Facts for Kids. Kiddle Encyclopedia.